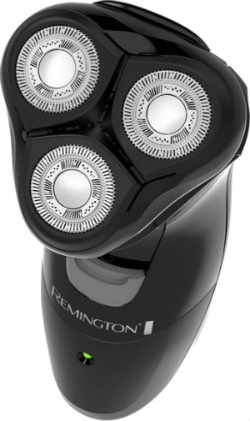 Remington is a well-known maker of men’s electric shavers. For men who prefer a rotary style shaver rather than a foil style one, it can be difficult finding an affordable shaver. 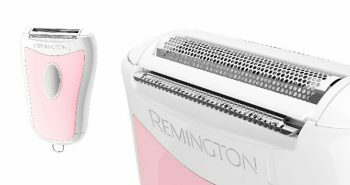 Remington has the Remington PR1235 R3 Power Series Men’s Rotary Electric Shaver for under $25, making it extremely affordable for everyone. This shaver is also cordless and rechargeable, but it is not waterproof, nor can it be used for shaving in the sink, shower, or bathtub. You’ll also not be able to shave with shaving gels, creams, foams, or soap, though you can certainly pat on aftershave to your face after shaving. For some men, they don’t have the time to mess with products, and are happy enough to have a dry shave. 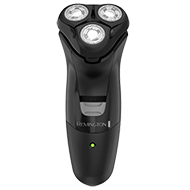 The Remington men’s shaver brand has the goal of placing closeness, power, and comfort all within one small personal grooming appliance that fits snuggly into the palm of your hands. 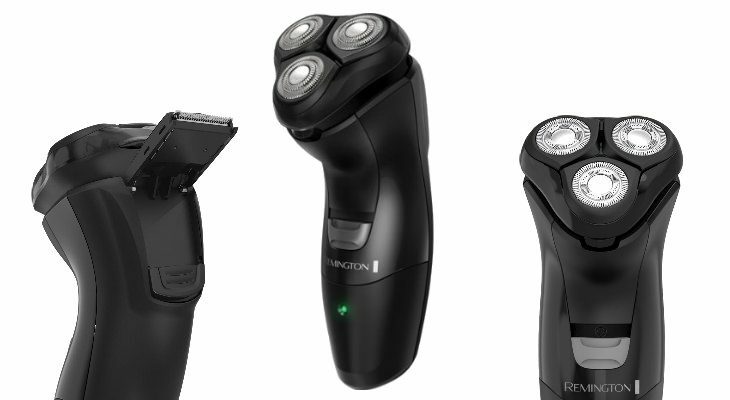 Remington has created the Power Series line of men’s shavers so that they deliver the maximum power, while still allowing for advanced comfort. The flex cutting adaptabilities in this shaver will also give a comfortable shave too. 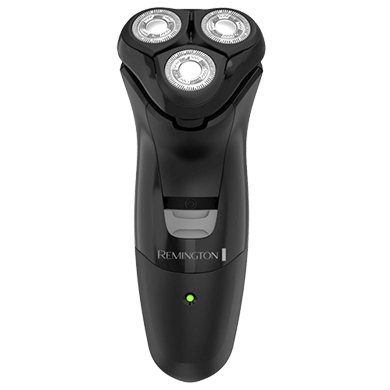 The Remington shaver comes in a black plastic casing with three small rotary heads encased in the top. There is a pop-up trimmer at the back of the shaver so men can sculpt around beard, moustache, or sideburns. The trimmer is also skin-friendly, which will minimize skin irritations or redness. 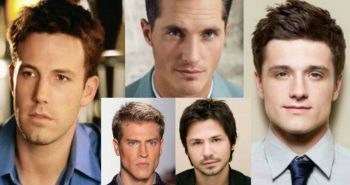 You’ll be able to sculpt almost any facial hairstyle. When not in use, the trimmer snaps back into position at the back. O n the lower section of the shaver is a green power on LED light so that you’ll always know when your shaver is on and ready to go. It’ll also tell you if it needs to be charged or not. The on/off switch is grey and is located in about the middle front of the shaver. The three small rotary heads are located at the top of the unit and stand out in a noticeable silver metallic colour. The Remington logo is printed just below the on/off switch. The blades built within the three rotary sections have active contouring. This means that the heads will always stay in close contact with the skin on your face, neck, or chin. There are also tiny precision cut slots built into the heads. The hair can easily slip into these precision slots allowing them to more easily be captured and then snipped off. These blades are all linked together, so that they work together to keep in close contact with your skin. 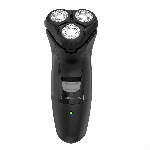 Remington has built this shaver with PowerFlex 360 degrees. 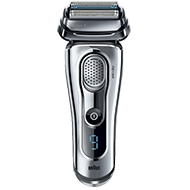 This means that the end of the shaver with the rotary head will adjust and move at any angle to help to reduce irritation while shaving the face. You won’t have to force your hand to move at uncomfortable angles. You’ll also find that your hands will not get tired easily. Each of the three rotary heads also is built with twin track blades, which are two circular rows of blades within each of the three rotary heads. 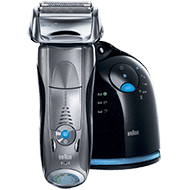 This is another system for ensuring that your face will be more effectively shaved, allowing for maximum skin contact with each of the blades. Each of the blades has also been designed with Precision Cut technology to give you the best advantages to when you’re wanting a close shave. This means that the shaver can shave off both stubble and longer hairs at the same time, without you needing to repeatedly move the shaver back and forth. One charging session of the Remington PR1235 R3 Power Series Men’s Rotary Electric Shaver will give you thirty minutes of cordless shaving runtime. It takes sixteen hours to fully charge up your Remington PR1235 R3 Power Series Men’s Rotary Electric Shaver. The shaver has a built-in NiMH rechargeable battery. Men will find that they can get three or four shaves out of one charge. A replacement head is available for when you find that the rotary blades are no longer cutting as well as they used to. Look for part number SPR-PR in online stores. 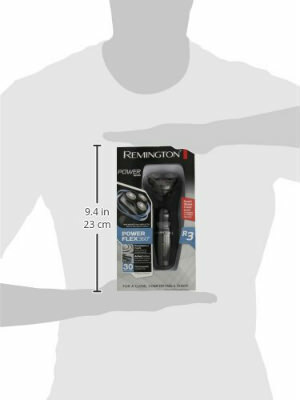 The Remington PR1235 R3 Power Series Men’s Rotary Electric Shaver measures 3” x 3” x 4.2 inches and weighs 12.8 ounces in the box packaging. 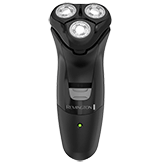 If you’re searching for an affordable men’s rotary style shaver, the Remington PR1235 R3 Power Series Men’s Rotary Electric Shaver may be what you’re looking for. Keep in mind that while it is cordless and rechargeable, you won’t be able to use it wet, which can be a deal breaker for some men. It also makes a great travel shaver for short weekend trips, camping, or storing in the car.